Today while we were at Home Depot, the sun started to set. I was given permission by the the manager to fly my drone. Enjoy the video and don't forget to subscribe for more future videos. Here is another experiment I conducted using a bowling ball, billiard ball, a flashlight and 3 cameras. I also had a mirror that was reflecting the sunlight onto the earth. It again demonstrated what I observe during sunrise and sunset every day. Feel free to comment below and enjoy the video. Here is a video of what the moon would look like moving over a globe compared to a flat earth. The results didn't surprise me but they may surprise you. Here is another video of the sunset this evening I captured with my #GoPro #Karma drone. In this video I attempt to demonstrate what the sunset and sunrise would look like over a curved surface and a flat surface. This time I set the light and moved my camera toward the light source instead of moving the light. The results are very similar to my previous results. Feel free to comment below and be sure to subscribe to my channel for more videos in the future. In this video I make another attempt to demonstrate what the sunrise and sunset would look like on a globe earth vs. a flat earth. The results of the experiment were rather shocking. Enjoy the video and feel free to comment below. Tonight there was an amazing sunset after the storm that passed through. Here is a video I took of the last 15 minutes of sunset with my #GoPro #Karma #drone. I sped the video up so you can see the storm system move as the sun goes down. Enjoy the video and don't forget to subscribe to my channel for more. In this video I demonstrate what a light source looks like as it passes over both a curved surface and a flat surface. The results are rather surprising. It appears that not only did #ElonMusk send a #Tesla into space, it also went back in time. The earth appears to be covered in water. Did it go back in time to the days of Noah and the Great Flood? Perhaps if you look close enough you can even see the Ark floating below. Be sure to subscribe to my YouTube channel at www.youtube.com/bryguy1955 for cool videos. Finally you can read my book titled "The Never Ending Letter" on amazon here. 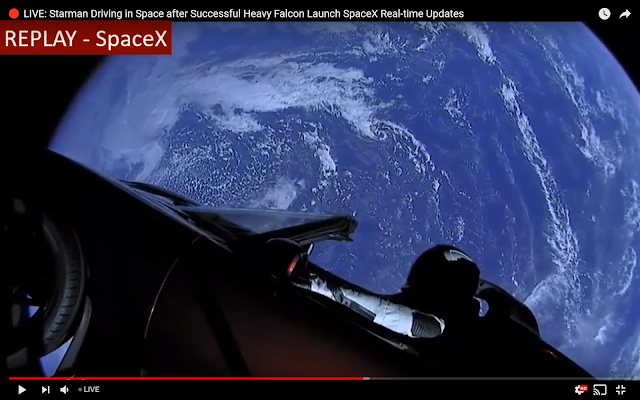 This video came from a portion of the live feed video directly on Spacex' YouTube channel. You can check it out on their Youtube channel yourself to verify it. It was taken around 2 hours into the video. Is it CGI or is it real video? Watch it for yourself and you be the judge. Don't forget to share this video and subscribe to my channel. How to dispose of an old Christmas tree "The Easy Way (TM)"